Remember those healthy homemade rainbow sprinkles I made last week? OF COURSE YOU DO! 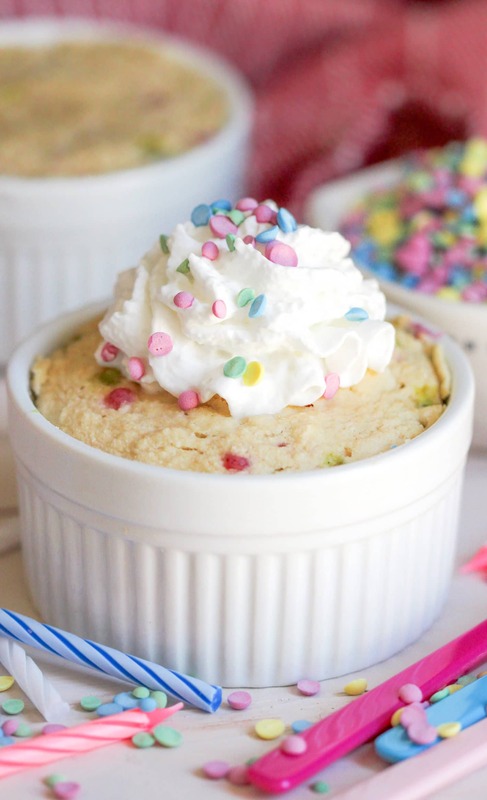 One of the first things I made with that (natural) rainbow goodness was this Healthy Single-Serving Funfetti Microwave Cake — a soft, fluffy, moist cake that’s speckled with fun rainbow confetti dots. This cake is buttery without the butter, sweet without the sugar, and rich without the excess calories. 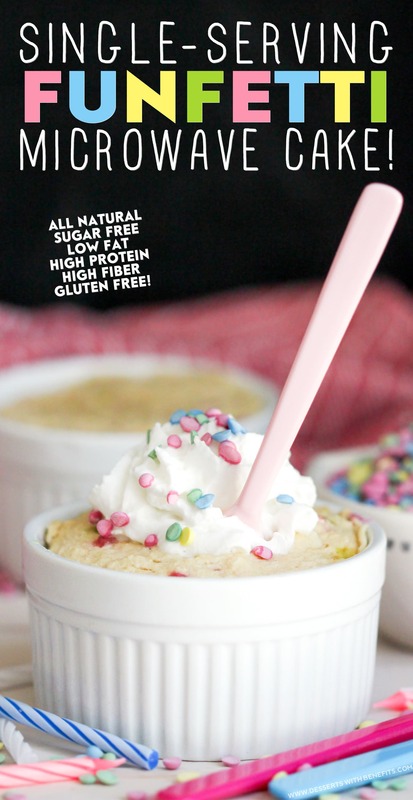 You would never ever ever know this recipe is sugar free, low fat, low carb, high protein, high fiber, and gluten free. And best of all? THIS CAKE HAS JUST 105 CALORIES! One bite and you’ll fall in love with this sweet, fluffy, and delicious, 100% from scratch mini Funfetti Cake. No need for that pesky sugar, trans fats, and artificial food coloring. 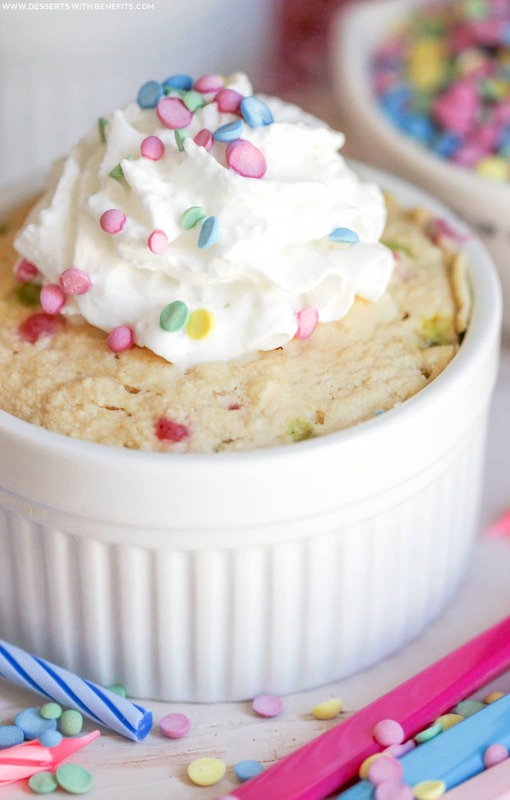 This Single-Serving Funfetti Microwave Cake is soft, fluffy, and speckled with rainbow confetti dots. It's nice and buttery (without the butter), sweet (without the sugar), and rich (without the excess calories). You'd never ever ever know it's sugar free, low fat, low carb, high protein, high fiber, and gluten free, with only 105 calories! Spray a standard-sized ramekin with cooking spray. In a medium-sized bowl, whisk together the milk, applesauce, egg white, and extracts. Add the coconut flour, baking powder, sweetener, and salt, then whisk until fully incorporated. Gently fold in the confetti. Scoop batter in the ramekin and microwave for ~3 minutes. Let cool slightly, then enjoy! **For a vegan version, substitute the egg white for ½ tbs Ground Flaxseed and increase the Unsweetened Vanilla Almond Milk to ¼ cup. Let the flax and almond milk sit together for a few minutes before continuing on with the recipe. If you want to see the nutrition label for the vegan version, click here. If you want to see the nutrition label of a typical (unhealthy) Funfetti Cake (recipe from Land O Lakes), click here. CAN YOU BELIEVE IT?!?!? Only 105 calories and 1.5g fat for your own personalized little Funfetti Cake! Plus, 6g of filling fiber and 7g of protein. BOOM. And, if you dared to look at the Land O Lakes nutrition label, then you know that making my Healthy Single-Serving Funfetti Microwave Cake will save you a whopping 405 calories, 27.5g fat, and 23g of sugar (that’s nearly 6 teaspoons of sugar in a single-serving cake). 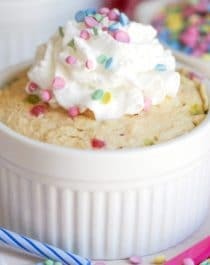 This Healthy Single-Serving Funfetti Microwave Cake is packed with fluffy, delicious, buttery sweetness. It’s heaven in a ramekin! It’s hard to believe you’re skipping out on all the processed flour, refined sugar, trans fats, and artificial ingredients. Moral of the story? Indulge sinlessly in this cake filled with addicting birthday cake flavor! This looks like an amazing recipe! This looks delicious and i’m amazed by the homemade sprinkles. The ingredients are all great but I have to ask with all the love & energy to make something healthy why microwave? Microwaves are really bad. It denatures the food and pretty much kills any nutritional benefits. Aw just what I needed! What do you think about oat flour instead of coconut flour? Celeste- I wouldn’t recommend replacing the coconut flour because coconut flour is a very unique ingredient. It absorbs A LOT of water, kind of like a sponge. I have tried the vegan cake with oat flour multiple times with bad results, the cake turns very dense and rubbery 🙁 However I haven’t tried using oat flour in the non-vegan recipe, you can try that if you like! Looks great – I don’t use microwaves so I’m wondering what temperature and length of time you would recommend cooking these in the oven? Thanks so much! Or, you can make this full-size Funfetti Cake, it’s just as delicious and baked in the oven! Wonderful recipe! Great texture – very fluffy and moist – and cooking it couldn’t have been any easier. It rose beautifully and cooked evenly (no burnt edges/flavour). I did make a few changes (replaced the butter extract with 1 tsp of macadamia oil and did not add a sweetener) as a couple of the ingredients were not in my pantry. I imagine your version is even tastier and will have to pick up some truvia and butter extract the next time I am out. Thanks for your advice! Adding a few extra drops of v/extract made it taste even more wonderful. I just love how this recipe allows the natural coconut flour flavour to shine through – the vanilla compliments it so well. I’m curious as to how the two versions (this one and the original from 2013) differ taste-wise and structure-wise? Or is it just a matter of calorie count? All the fun with none of the guilt? YESSSS PLEASE! Love that you used butter extract here, this is my favorite extract in the entire world! I made this. I am sad with the results, but maybe that is my fault? While my cakes were baking, they smelled so good! I followed everything EXCEPT I omitted the butter flavor… I didn’t think it would make a difference since it was just a 1/4 a teaspoon…. The texture looks good, it smells inviting, and even tastes good! Just one thing: When I take a bite, it feels like I am eating flour that is held together. I believe this is my fault because all the other microwave cakes I have made worked so well. Sorry to say this. Otherwise it is pretty and I appreciate the recipe. Trial 1#! I will try again, after purchasing butter flavor! !